I’ve been ill the past few days and work has me busy until the end of the year. But look! It’s eggnog season already. Is that shake and pour bisquick?? My only judgment is…Ew…egg nog. Nasty. Sarah–Uh yes. I wasn't shopping alone that day so I'll let you figure out what happened. :)Jodi–Yeah, eggnog is a bit gaggy. And I remember you have a thing against eggs too. Well I LOVE egg nog, and egg nog-related products! Egg nog lattes, egg nog pancakes, egg nog cookies … YUM. Yay for egg nog season! Is that the Albertson's "around the corner?" I loved that store. It's just big enough to get what you need, but not "scuzzy" like the Vons across the street. I recently saw egg nog flavored ice cream. I'll stick to the other flavor(s) of the season: pumpkin, pepermint, and chocolate! 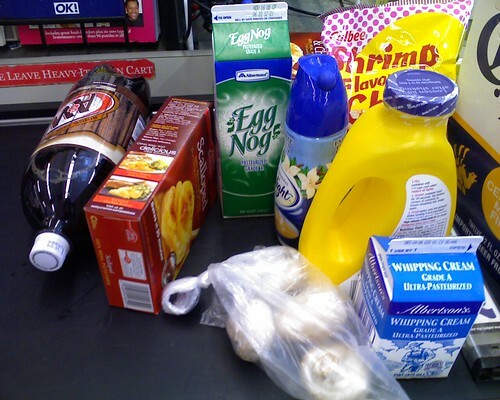 Chris–Unfortunately I can only take eggnog in tiny quantities. More than that and I start to gag. Too much cream. You can have my share.Mrs. Wong–It is! That scuzzy, ghetto Vons is still there. I was there recently and it has not changed one. bit.